Chrysolite is the seventh precious stone, mentioned in the Bible, used to create the foundation of God's New Jerusalem (Revelation 21:20). Our English word is derived from the Greek word chrusolithos (Strong's Concordance #G5555). This word occurs only once in the entirety of the Bible. Chrysolite is not mentioned either as being embedded in the High Priest's breastplate (Exodus 28:17 - 21, with parallel list in Exodus 39:10 - 13) or as one that Lucifer was created with (Ezekiel 28:13). Strong's defines chrusolithos as a gold or yellow-colored gemstone ("gold stone"). Thayer's lexicon says it is golden colored. All ten versions of the Bible used for comparison purposes in this series translate the word as "chrysolite." The 1906 Jewish Encyclopedia states the following tradition regarding relationship between chrysolite and the Bible's Ark of the Covenant. "Others said that there was in the Ark a figure of chrysolite or ruby with the head and tail of a shecat and with two wings. It would utter a moaning sound, and the Ark would rush toward the enemy with the Israelites following it. When it stayed, they stood and were at ease, and victory came" (article "Ark of the Covenant"). How much gold did King Solomon own? The golden yellow color of chrysolite was associated with the sun and Sunday. A donkey engraved on the gem gave the wearer the ability to predict the future. On the other hand, if a vulture was etched on the stone it gave the person who possessed it the power to control demons and the winds. 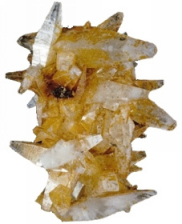 Chrysolite was also thought to dispel various "terrors" of the night but only if it was worn in a setting of gold (Curious Lore of Precious Stones, pages 66 - 67, 133). Why do people go to church on Sunday? What does yellow mean in the Bible?